Ashgabat, 31 August, 2018 – the conference dedicated to upcoming «Amul-Khazar 2018» international rally was organized at the «Sport» hotel in Olympic village. Senior officials, staffs from ministries and agencies responsible for organizing «Amul-Khazar 2018» international rally, media representatives, NGOs teachers and students of institutions of higher education participated in this event. On August 31, the minister of the Ministry of Internal Affairs of Turkmenistan presented international licence and technical passport of sports car to the leader of nation Gurbanguly Berdimuhamedov in the meeting of Cabinet of Ministers of Turkmenistan. Our country will be represented by 15 teams which passed qualifications in May, this year and they are from the Auto Racing Centre of the Ministry of Internal affairs and National Federation Automobile Sport. Speakers have stated that, recent preparations for rally in terms of organizational and technical matters, as well as strengthening sports capacity of the state, developing international relations in given field have been done in collaboration with experts and well-established companies organizing such events. After the conference participants’ statements, the members of Turkmen team were solemnly granted licenses of pilots and navigators. 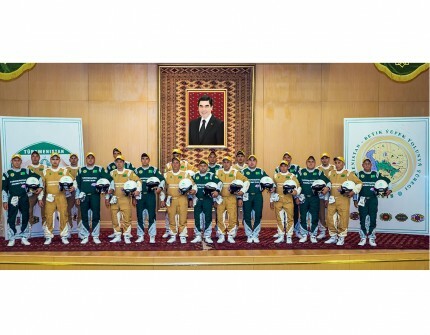 Special sports outfit for racers were presented in the name of the President Gurbanguly Berdimuhamedov.